Big climbs meant big action in Stage Six, as the racers faced their toughest challenge yet. This route first takes racers around the volcano and into the jungle, where a 600-meter, 8% hill wakes them up with an early challenge. They then ride a loop of the false flat jungle circuit before heading back to complete the reverse Epic KOM mountain climb. It’s 6.2 km long with an average 6% grade. As the speed lowers and the draft effect lessens, the race becomes a test of strength and power-to-weight. Finally, a long descent brings the racers to the flat Ocean Boulevard and a beachfront finish on Watopia island. 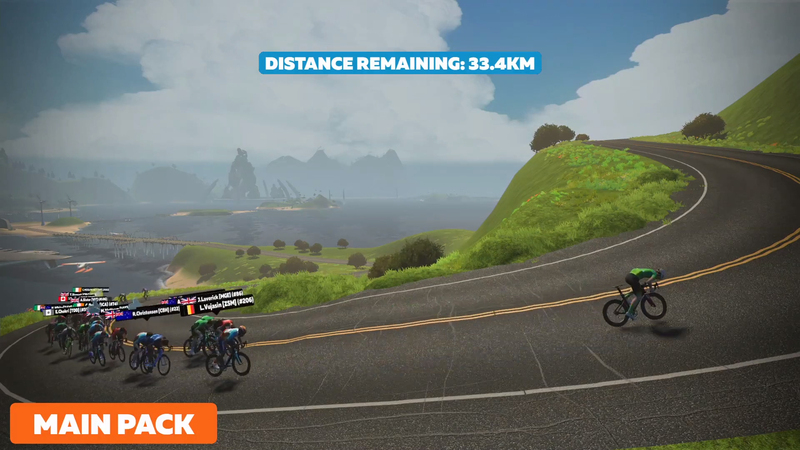 Ollie Jones (Zwift Academy Dream Team) shot off the front of the group as soon as they started the hill up to the jungle, just 9 km into the race. He quickly gained several seconds on the peloton and held his lead. Joe Laverick (Madison Genesis) worked hard at the front of the group trying to bring him back, and others eventually joined him. Riders began dropping off the back one by one. As they gradually descended into the jungle, only 18 remained in the group, with Jones still out front. They finally caught him as they entered the jungle after he spent 5 km solo. That would not be the end for Jones, who was named the most aggressive rider. He attacked again as the riders started the gradual climb out of the jungle. This time he didn’t get very far, but it was enough to get Conor Dunne (Israel Cycling Academy), Mikey Mottram (Vitus Pro Cycling), and others to go to the front and close the gap. Mottram tried a counterattack, but it too came back quickly. The strong draft effect on flatter ground and shallow climbs meant that solo riders could not stay away from a group that was working together. Jones tried again to get away on the reverse Epic KOM climb. He dangled just off the front at the start, as if daring the others to follow if they could. Eventually, a few did, led by Madison Genesis. Their acceleration near the top dropped some of the riders who were still hanging on. Ben Healy (Team Wiggins–Le Col), El Mehdi Chokri (Dimension Data U23), Jesse Featonby (Oliver’s Real Food Racing), and Lionel Vujasin (Zwift All Stars) were some of the last to fall. Only 8 leaders reached the top of the mountain together. Madison Genesis had three riders in the front group with Laverick, Ian Bibby, and Johnny McEvoy. 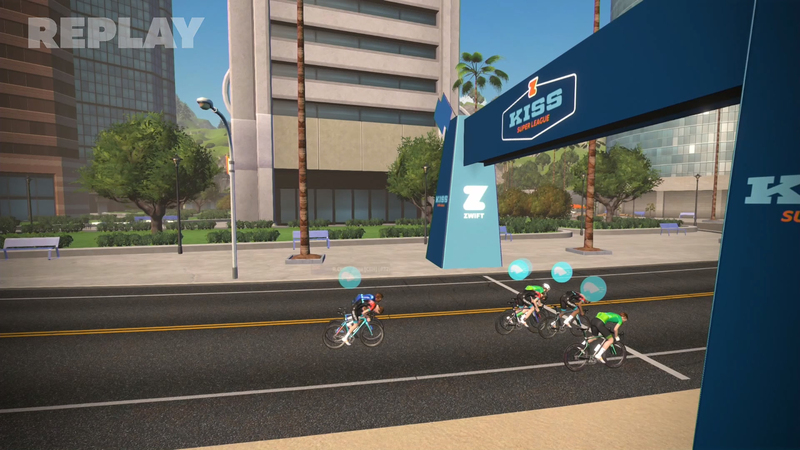 The Zwift Academy Dream Team had two – Jones and Alex West. Ryan Christensen was the lone rider from Canyon dhb p/b Bloor Homes. 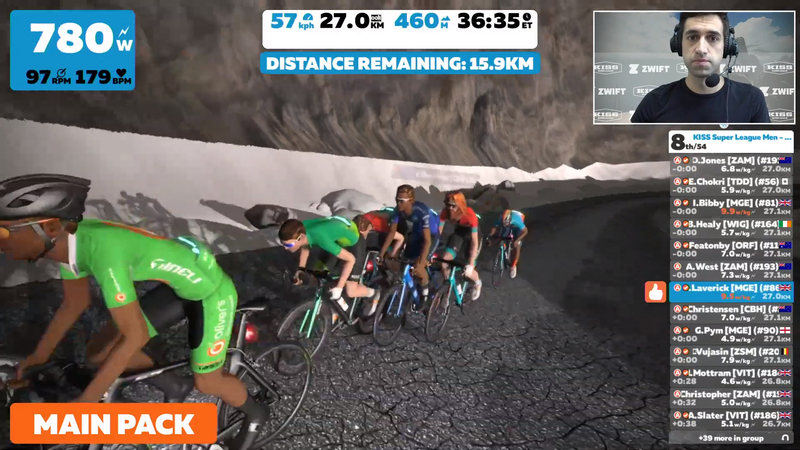 The Zwift Academy All Stars attacked again on a small kicker on the descent. This time, it was West putting on pressure. 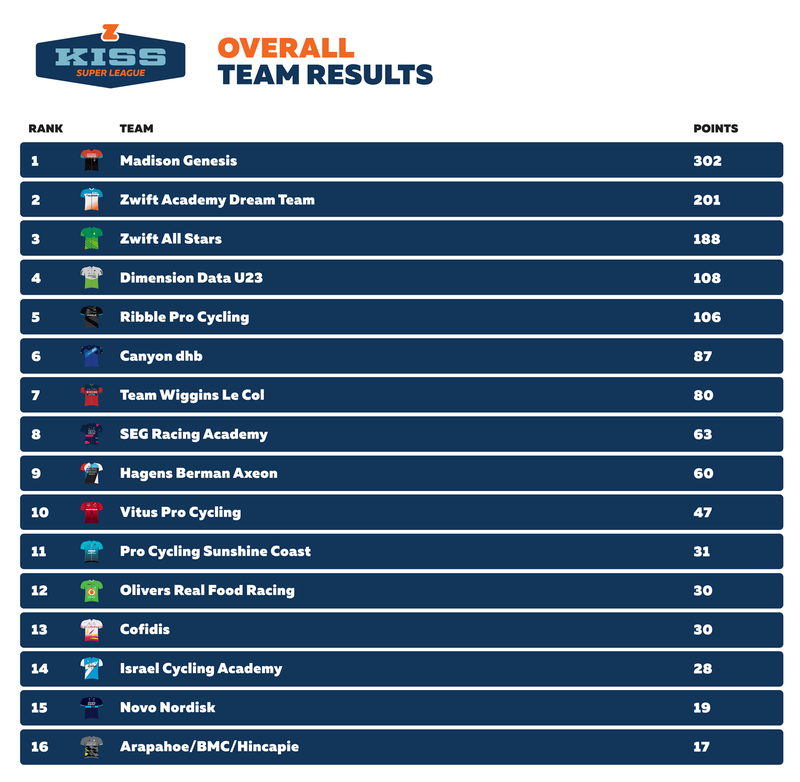 Madison Genesis reacted quickly and shut it down. The riders entered a flatter section into the underwater tunnel, and Laverick attacked with 3.5 km to go. The Zwift Academy Dream Team countered and it came back. At about 2 km to go, West and Bibby both broke away. Christensen was forced to spend energy to close the gap. The others weren’t going to leave his slipstream to chase their own teammates! McEvoy went to the front of the group to lead out his teammates for the sprint. The aero helmet PowerUps popped, but there was one feather PowerUp in the group – from Christensen. The racers charged ahead. It looked like Jones might win the sprint, even after all of his attacks! But Bibby nudged past him right at the line for his second victory in the KISS Super League. Jones knew he had good legs Wednesday after illness had forced him to take a short break. The Zwift Academy Dream Team decided to use that to their advantage. They wanted to make the race as hard as possible. “We saw Madison had a couple of riders in who hadn’t done KSL before so we wanted to put them under pressure, and also the All Stars since we were very close overall with them,” he said. Jones added that they expected West would have the best sprint of the racers while fatigued, based on last week’s winning performance. Once the attacks and hills had shrunk the group, Jones said the long descent gave the racers some time to recover and think about their plans. Now, he and West just needed to pay attention and make sure that nobody from Madison Genesis got away before the sprint. 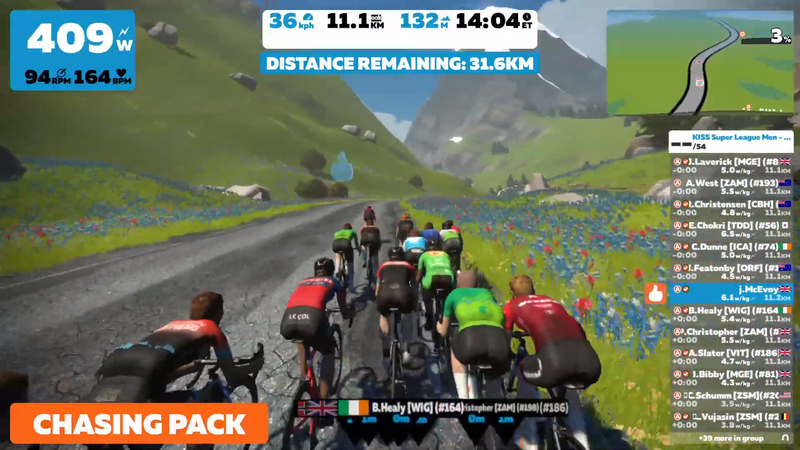 In a first for the league, the Zwift All Stars weren’t represented in the front group. 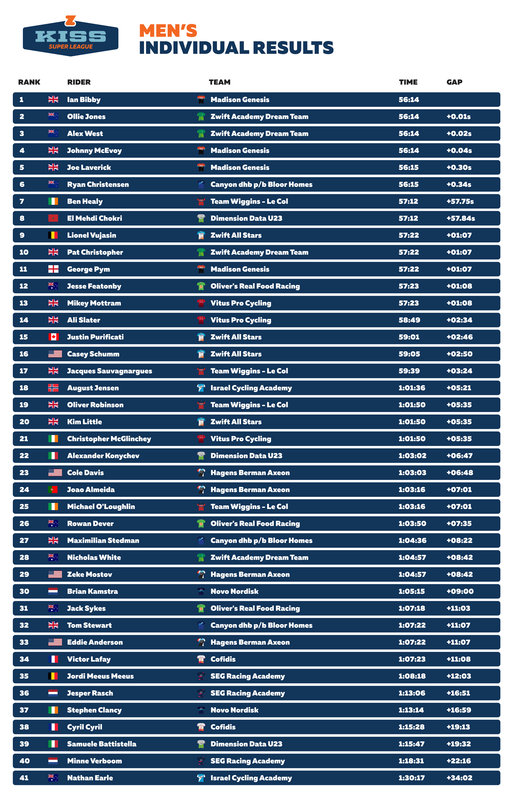 But they, along with Madison Genesis, still placed all four riders in the top 20. Tune in live next Wednesday to see what happens!